Where do I find the statistics for my survey? Can I reset them? The statistics can be found in Statistics>>Survey statistics. Switch between tabs to check the summary, stats for the questions and respondents. 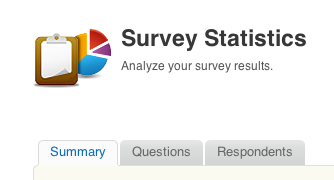 In order to reset your survey statistics you need to close and disable the survey and then restore it. All those steps can be taken in Surveys>>Surveys list. To restore the survey please switch the tab from Enabled to Disabled.